Talhenbont Hall on the Lleyn Peninsula in Wales dates back to 1607, when it was used as a garrison for Cromwell’s army, and has a fascinating history. The property now offers an estate of 75 acres and five restored cottages which are used as holiday lets. The main manor house itself has been sympathetically restored over the past 30 years and retained much of its period charm, including oak-panelled rooms, superb fireplaces and its coat of arms. Internally the reception rooms are elegantly arranged around the reception hall, and many have high decorative ceilings and let in lots of light. Upstairs is ample bedroom accommodation with six bedrooms on the first floor and four attic rooms, two of which are substantial. In the grounds are five self-catering cottages which also retain character features like timber beams and exposed stone walls, and operate as a holiday lets business. The gardens and grounds are an undisputed feature of the property and include a Japanese water garden, water fowl, roaming peacocks, outdoor chess, a putting green and a tennis court. The Afon Dwyfach river flows for a mile ad a half through the grounds and provides double bank fishing as well as running over a series of waterfalls in a ravine through the ancient woodlands; it’s also a designated habitat for otters. Deep and shallow pools harbour salmon and trout throughout the season and there is rough shooting in the woodlands. A coach house sits next to the manor house, as does a loose box and other outbuildings. 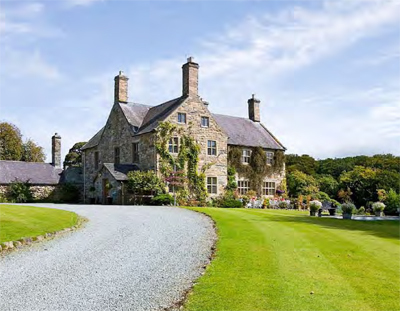 Talhenbont Hall enjoys a magnificent location in the heart of the very pretty Lleyn Peninsular, on the edge of the Snowdonia National Park and within easy reach of Criccieth, Abersoch and the sea. The guide price is £1.5m. For further information please contact Carter Jonas on 01248 362536 or visit www.carterjonas.co.uk.